My ten year old son finished reading his 10th Roald Dahl book last night; a huge feat as just 12 months ago he could barely read. We were happily chatting away about his reading progress when he turned to me and said, “Mum, I don’t want you to show me my school report card anymore; it makes me feel bad”. To me this statement felt like a hot knife going through an old scar; a culmination of years of anxiety about his school failure and low self-esteem that had come gushing out in one swift slice, but why was he smiling? It only took a few seconds to understand that he had in fact made this statement as a point of empowerment; his grades didn’t define him and he was going to be ok.
For the last four years we have travelled the dyslexia journey; from the shock of receiving no support at school, the ensuing panic attacks and daily school anxiety, researching, connecting, advocating and finding the path to success; we did it together and it has created an unbreakable bond between us. I gave up on relying on the school system for help and took matters into my own hands. I focussed on evidence based teaching methods found elsewhere; mainly via a home reading and spelling program and weekly sessions with a Speech and Language Therapist. The results were instant and culminated quickly into my son’s recent reading success. Twelve months ago he was reading at a year one level in year four; now he is reading at a year six level in year five! Five years of phenomenal progress in one year. We found the path to remediation that the majority of schools struggle to find. It started with the phonics check to see what aspect of reading he struggled with and then progressed to implementing a systematic synthetics phonics strategy. My son now has the confidence and the ability to understand and work with his dyslexia that he doesn’t need a grade to tell him his worth. He sees his achievements every day and his unwavering effort is fuelled by his desire to learn. All kids with dyslexia deserve to feel this achievement, regardless of parental income or choice of school. After all, isn’t reading a basic human right that we must insist is taught proficiently to all students in all schools? Parents should not have to spend tens of thousands of dollars on private intervention because children fall through the cracks; you can’t learn if you can’t read and the appalling literacy rates of school leavers in this country reflect our broken system. How can 44% of school leavers be functionally illiterate in the lucky country and nothing is done? (ABS statistics, 2013). 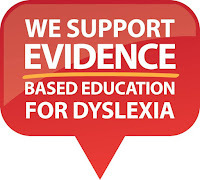 The one in five kids with dyslexia are rarely identified because there is no simple check in the first years of schooling to inform parents of a possible problem. 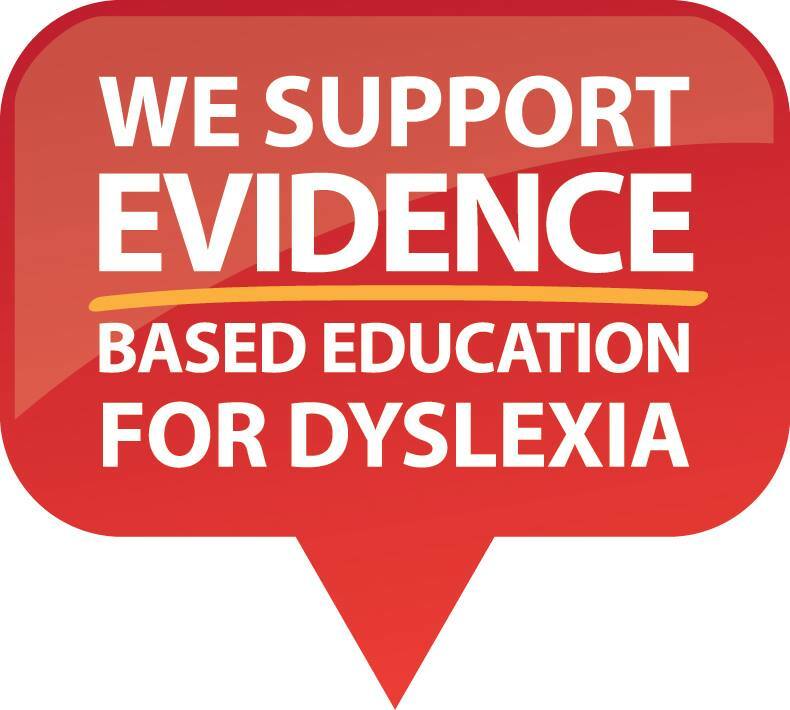 Early intervention is the key to success; but children are subjected to years of failure, mental health problems and disengagement because dyslexia is not identified or funded in the school system. Parents watch their child implode under the strain and the education system finds it easier to put them in the ‘too hard basket’. The ‘too hard basket’ has existed for too long; when the solutions are relatively simple. Unfortunately, education is a hot pit of ideology and ingrained orthodoxies that rarely rely on the evidence of teaching methods or the children suffering behind a political agenda. 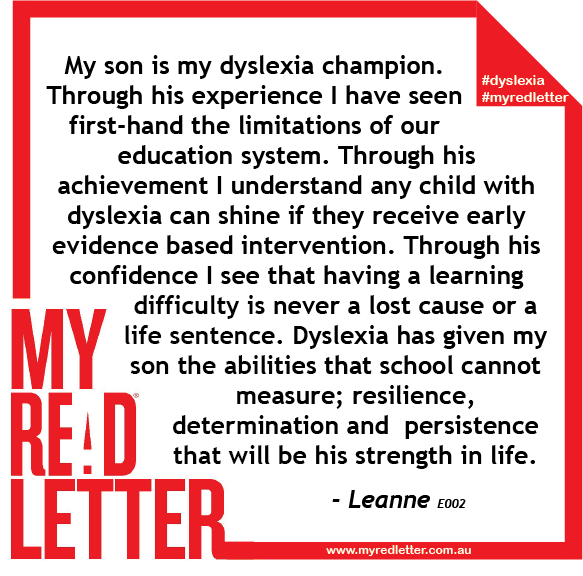 My son is my dyslexia champion. Through his experience I have seen first-hand the limitations of our education system. Through his achievement I understand any child with dyslexia can shine if they receive early evidence based intervention. Through his confidence I see that having a learning difficulty is never a lost cause or a life sentence. Dyslexia has given my son the abilities that school cannot measure; resilience, determination and persistence that will be his strength in life.